Calum MacLean is twenty-nine years old and lives alone in Glasgow. He is a killer for hire, a hit-man who takes jobs to suit his own schedule and which allow him to minimise the risk to himself. When he accepts a job from Peter Jamieson, he is accepting a more permanent position within the Jamieson organisation. The move has perks, but with it comes a certain loss of freedom. 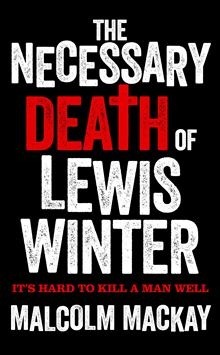 The job is a straightforward one: kill Lewis Winter, a drug dealer so far down the food chain from the Jamieson organisation that he shouldn’t even be on their radar. But Winter is moving into Jamieson’s territory, and looks to have potential backing from a bigger player. With this simple premise, Malcolm Mackay sets the events of his debut novel in motion. While Calum is ostensibly the story’s central character, he spends a good portion of the novel in the shadows, as perhaps befits his chosen career. Mackay spends time introducing us to the victim and his nearest and dearest, as well as various factions within Glasgow’s criminal underworld, and members of the Strathclyde Police. The lines of moral distinction between these characters are deliberately blurred: there are no good guys and bad guys in this story; Calum may be a cold-blooded killer, but he is also a man doing his job, while the handful of police officers seem to have agendas of their own in carrying out their investigations. The reader is left to form their own impressions and decide for themselves where their sympathy lies. Mackay’s narrative style is beautiful. Using a conversational tone – a “just between us” approach to telling the story – coupled with the telegraphic style of James Ellroy’s finest works (though perhaps a bit more passive than Ellroy’s abrasive style), he places us directly in the middle of the action and, to a certain extent, makes us accomplices to what is going on. Frequent use of the word “you” – in the general sense, rather than the jarring second-person approach – makes this an easy and engaging read. We’re given details grudgingly, as if they don’t really matter to the story – they often don’t, but they paint a picture, make the characters seem more human, give us something to identify with in a group of people who are, for the most part, people we wouldn’t necessarily want to associate with. Saturday afternoon, football on the radio in the background, sitting on the couch with a book. The Painted Veil by William Somerset Maugham, if you must know, and he’s fascinated by it. It has lured his attention away from the radio; he doesn’t know what the score is any more. The older he gets, the less important that seems. We’re lured quickly into a world where no-one talks straight, and where every question, every answer, every gesture has an implicit meaning that only members of this secret club can decipher. There’s a thrill to this for the reader, a sense that we are being given a glimpse behind the curtain, a brief look at a world that exists outside the boundaries of our normal experiences. The clues are all there if you care to look for them. Perhaps you don’t care to; most people don’t. A casual conversation: two people who know each other on a first-name basis, without being too close. Friends who see each other on a weekly rather than daily basis. Friends who don’t care. Phone calls like that are made so often, so why care? It’s a job offer. A very definite offer of something long-term and lucrative. The novel takes us through preparation, attempt and subsequent investigation, showing us the story from a number of different angles in the process. There is no mystery here for the reader as we, like the narrator, can see everything that is going on. But mystery was never the point; this is about the people, their relationships with each other, their interactions, their lies and half-truths. It is also the setup for a much larger story, the first part of Mackay’s Glasgow Trilogy which is set to continue later this summer. If Mackay can maintain this momentum with the second and third parts of the trilogy, it stands to challenge Derek Raymond’s Factory series and David Peace’s Red Riding Quartet as the benchmark for British noir fiction.